Dentures Lansdowne, VA 20176 | Atiyeh Emam, D.D.S. 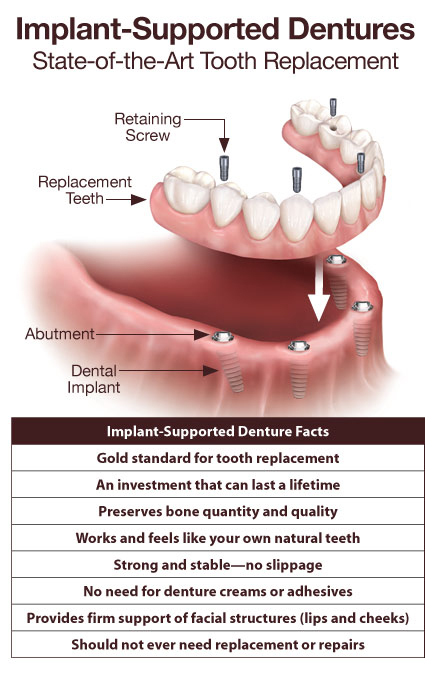 There is a way to permanently replace a full set of teeth and prevent bone loss as well: implant-supported dentures that are fixed in your mouth. Anchored firmly into the living bone tissue, dental implants provide the stimulation and support needed to prevent bone from being lost. The bone in your jaw actually fuses to the implant, due to the remarkable osseophilic (bone-loving) properties of titanium, the metal of which dental implants are made.